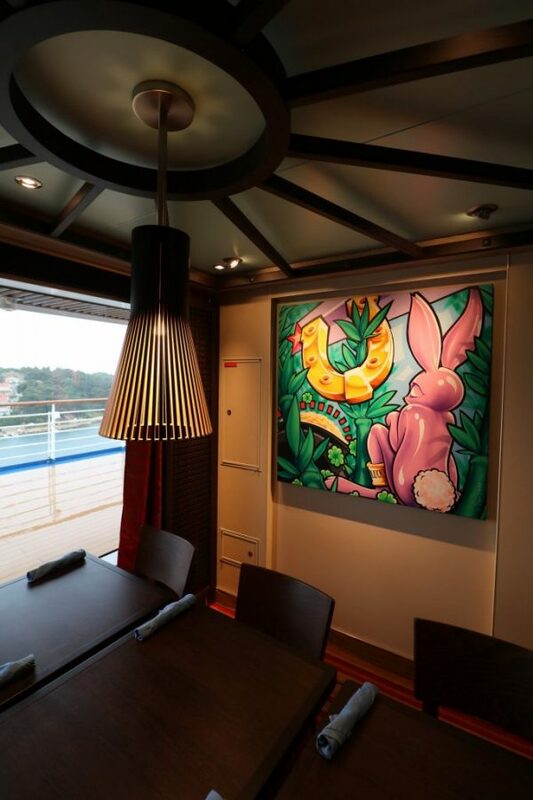 On my last blog post, I tackled the question ‘Can you cruise vegan on Carnival?’ and featured my breakfast options onboard the brand new Carnival Horizon. I hope you were as pleasantly surprised by the breakfast choice onboard as I was. Over the years I have sailed on many companies and never had as good vegan morning choice available to me. I am even more excited to give you the news regarding lunchtime vegan catering on Carnival. 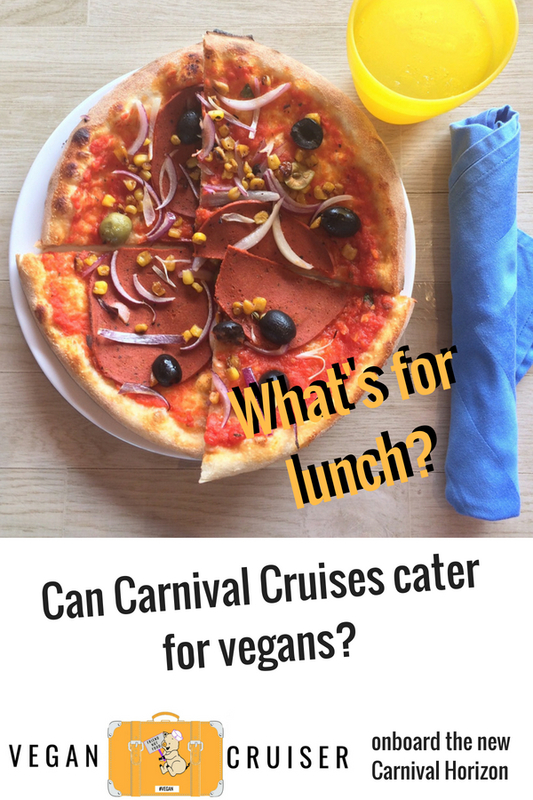 The answer to ‘can you cruise vegan on Carnival?’ is going to be an even louder ‘YES!’ for lunch options than it ever was for the breakfast options. On our ten day sailing, we had some very intensive port days. Often we arrived in port before 8am and departed 10-12 hours later. So we didn’t always get to have our lunch onboard – instead, we’d sample what our fabulous ports had to offer. Lots of vegan gelato was consumed, as you can imagine. But on other days we were able to easily pop back for lunch, we did. And in Dubrovnik, we gave up on sightseeing early as the heavens opened. It meant we made it back in time to have lunch onboard and try a new venue. And why not? You’ve paid for all this amazing food so why not enjoy it. 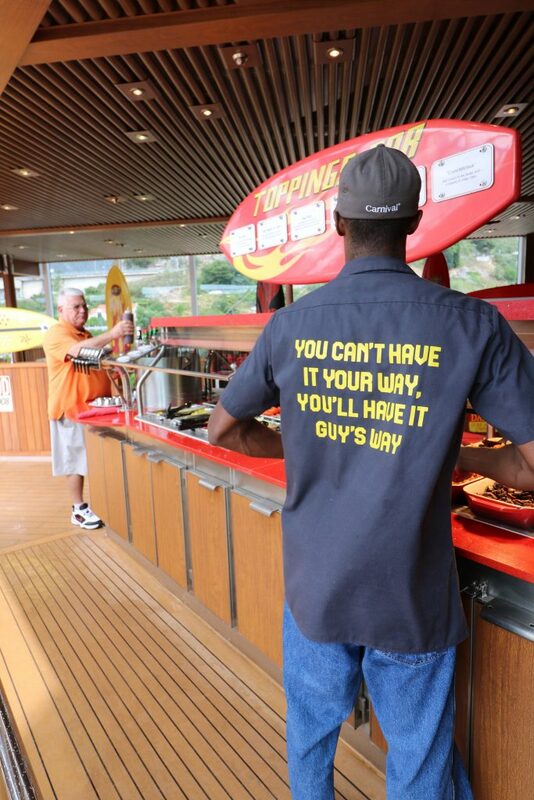 Too often the embarkation the lunch choice is the buffet only. Specialty restaurants tend to open for dinner only on the first day. 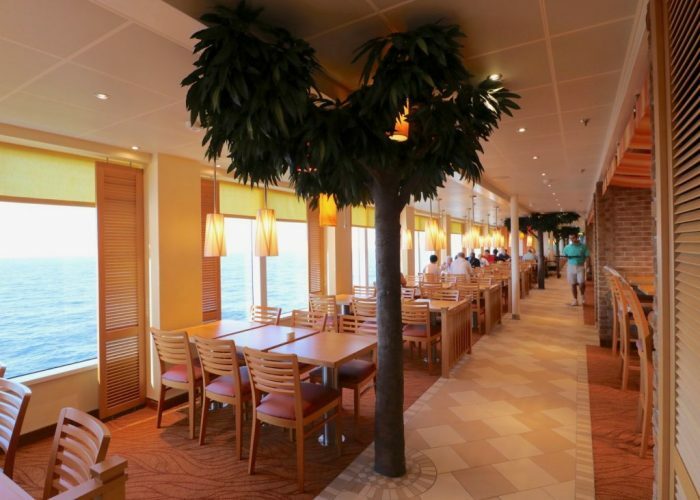 It appears to be rare to have the main dining room open for lunch on embarkation day. 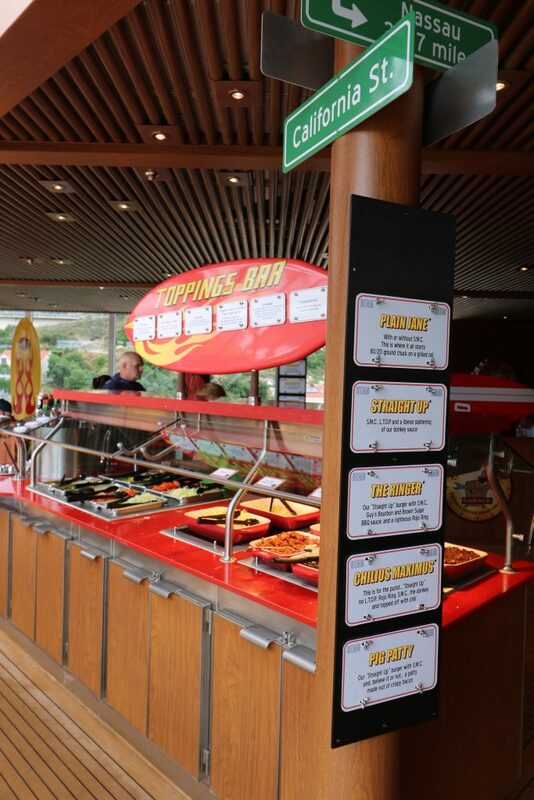 So out of habit, we headed up to the lido on deck 10 to explore what the Marketplace buffet had to offer for us. Although Blue Iguana and the Guy’s Burger were both open on the lido, we headed to the Marketplace to see what options they served. Much like at breakfast (I discovered over the days) there wasn’t a lot of ready-made choices. Vegetarian options often had cheese and sure enough, on embarkation day the only obvious option from the buffet was the salad bar. I knew to go to the Deli counter though, as they offer a falafel wrap that can be made vegan. As long as you request it without the tzatziki yoghurt sauce and without the feta cheese you’ll have an easy vegan lunch option. I complemented mine with some salad bar extras and fries from the Deli. Wrap consisted of hummus, tahini, lettuce, tomato and couscous salad. Never actually saw big falafel pieces and certainly didn’t see chickpeas either. The second time I had this over the ten days was late evening (peckish after early dinner) and I asked for some sauerkraut for some extra tanginess. The MDR wasn’t open on our first embarkation afternoon either, but all my usual lunch spots were open and will be covered in this post. The MDR does offer a Seaday Brunch so we could have dined there on our three seadays. 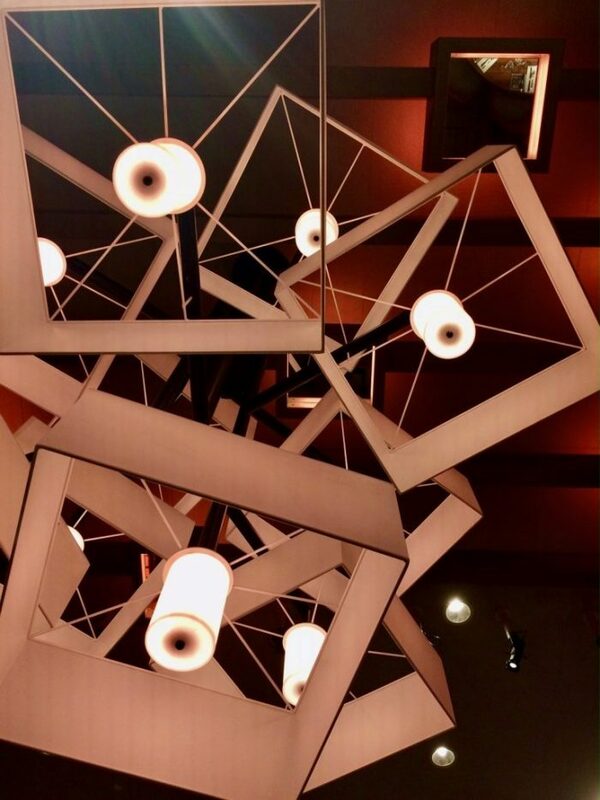 I couldn’t see anything easily adaptable on the menu – neither did any of my waiting staff advise what they could prepare vegan for me. 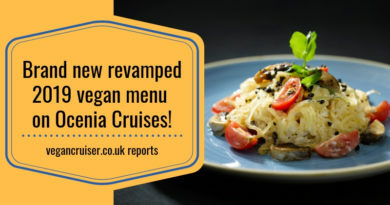 But, other members of the ‘Vegans Cruisin’ on Carnival’ Facebook group have succeeded in having great vegan brunches on other ships in the fleet – with vegan pancakes etc. So it is possible to have a calm, sit-down MDR brunch – just that we never attempted it. 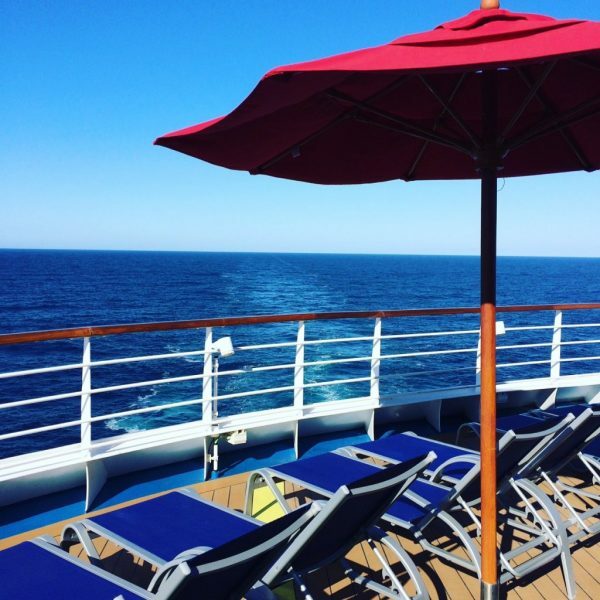 I stuck with our deck 10/11 Lido favourites – I loved having so much vegan choice! For a venue that advertises on the back of their team-member shirts “You can’t have it your way, you’ll have it Guy’s way” you’ll be surprised to find that Guy’s Burger can indeed cook up a vegan veggieburger. It is certainly not on the menu, but if you speak to the staff, they will be able to get one cooked for you in the adjoining kitchen. Just specify no butter, no mayo, no cheese and you’ll get a warmed bun with a veggie burger you can dress yourself. Salads, gherkins, tomato sauce etc you can add at the nearby station. 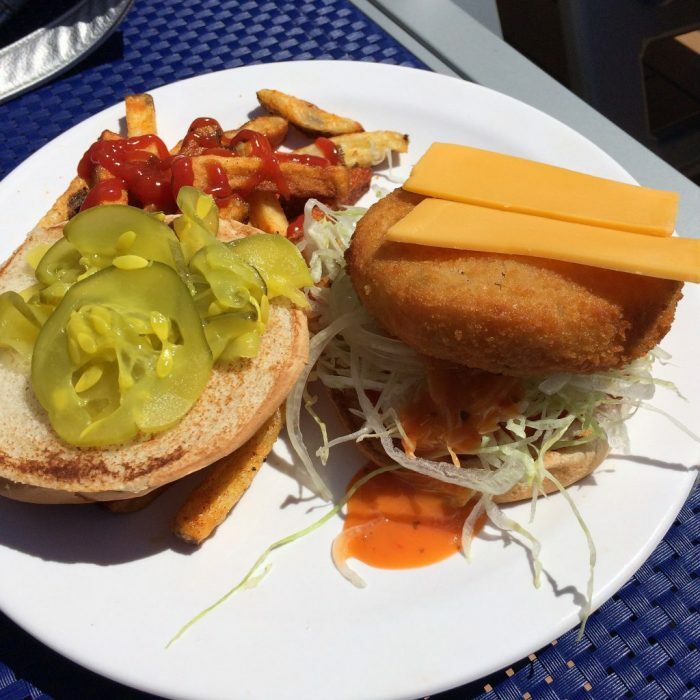 Some previous cruisers from ‘Vegans cruisin’ on Carnival’ FB group had been told Guy’s would need a day’s notice to have veggieburgers available. Presumably, some ships don’t have much demand for veggie burgers and they need defrosting. But at least on the Horizon, all notice I needed to give them was 10-15 mins or so. John Heald, the brand ambassador for Carnival, has confirmed on his FB page that the vegetable burger patty/brand is vegan. I pimped up my vegan burger with some Daiya cheddar I had brought onboard with me (kept in the cabin minibar) and red pepper salad dressing. I already loved Blue Iguana’s breakfast burritos (see my Carnival breakfast post) and could drop by at lunch too. Unfortunately, the vegan-friendly hash brown pieces were a breakfast item only. Vegan lunch wrap or fried Burrito bowl can be filled with vegetables only (not the refried beans, as those have lard). You can complement the bowl or wrap with a burger from Guy’s next door. 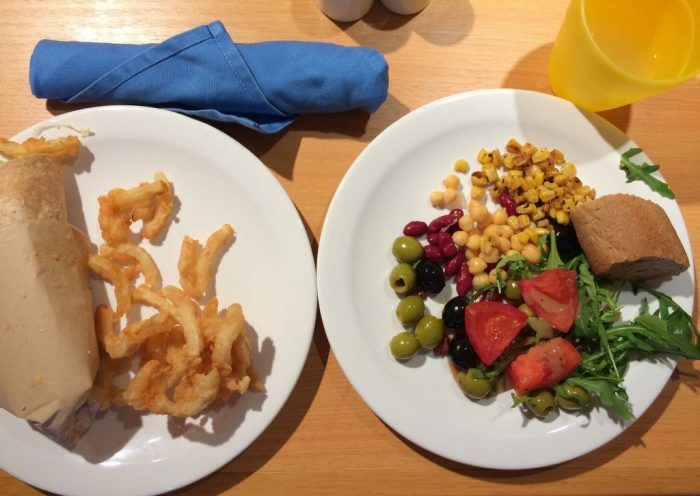 Marketplace buffet may also have an ‘accidentally vegan’ vegetarian options to add to the dish. 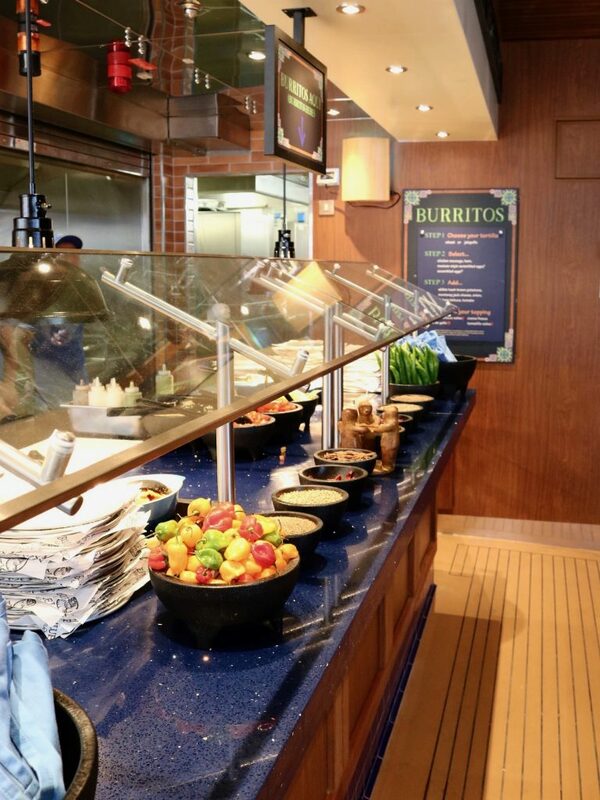 The staff couldn’t tell me if the squeezy guacamole was vegan (I was doubtful) but you could always request fresh avocado from the galley (as it is available at breakfast). Rice served onboard has butter through it so if you want your Burrito bowl with rice, do order a separate vegan batch of rice for yourself. You will need to obviously plan ahead and request it in time for the rest of the dish, but it is great that staff even on the lido are happy to take special dietary orders. 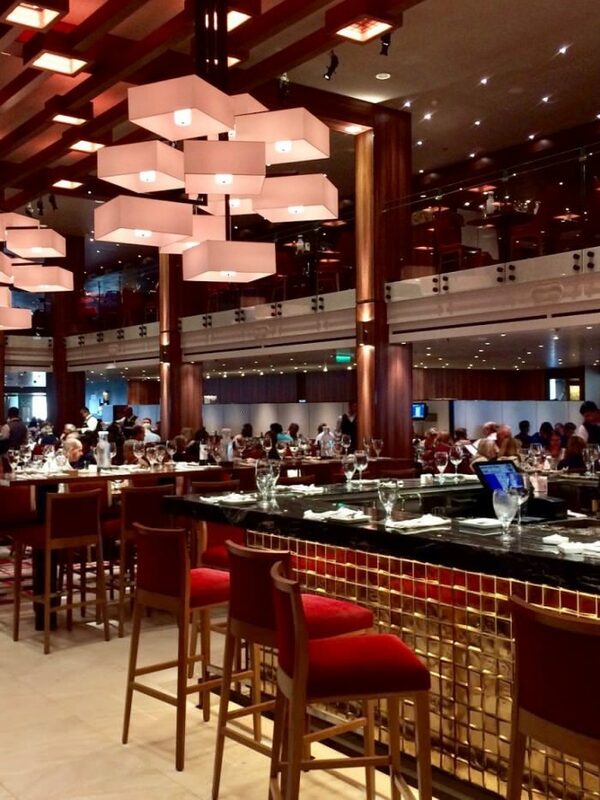 Above the Marketplace buffet, on deck 11, are the specialty restaurants JiJi Asian Kitchen and Cucina del Capitano. 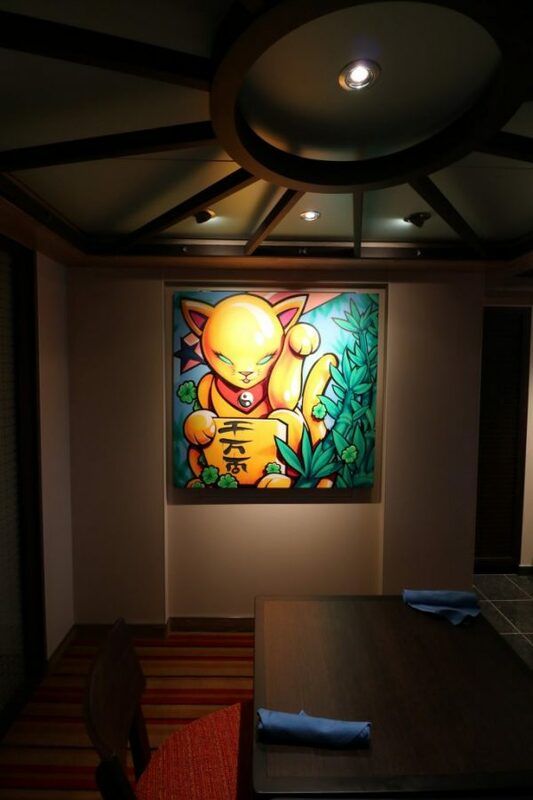 Both venues carry a cover charge at night, but these two dining venues are free during lunch hours (12-14.00). Former is named Mongolian Wok at lunch and the latter the Pasta Bar, offering made-to-measure dishes. 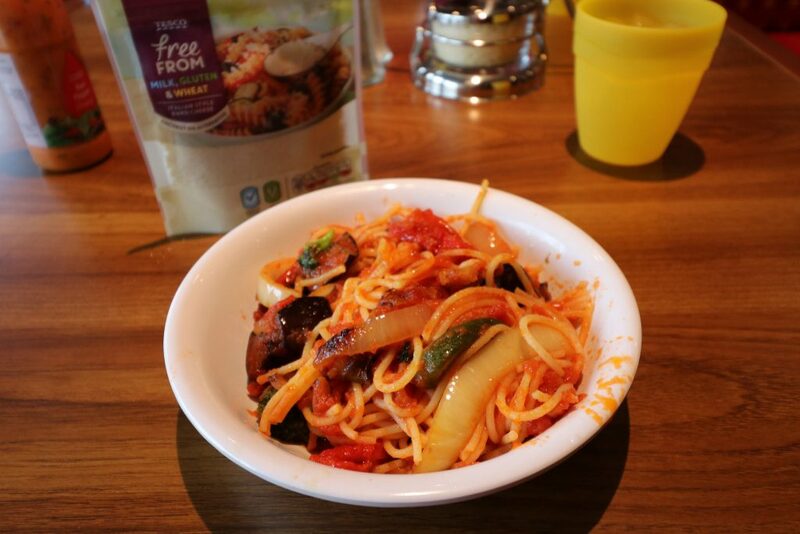 As you get seated, into both venues, staff will give you an order form to tick the particular type pasta or noodles, sauce of preference and meat options – vegan choice in both restaurants is vegetables only, no mock meats or tofu. I tried asking, as you see I added it to the list but kitchen said none was kept in the Wok kitchen. Perhaps it could be pre-arranged as the ship does serve tofu, it just isn’t on the menu for either of the two ‘free’ lunch venues. We ended up in the Pasta Bar for lunch when we were docked in Dubrovnik. Our plan had been to explore this beautiful city and lunch out, but the heavens opened after our Old City Wall walk. We tried to wait out the rain but it did not stop. So, we took refuge onboard and after lunch, the weather cleared enough to enjoy the beautiful Croatian scenery on the lido. The waiting staff in the Pasta Bar advised me that the only pasta I could have was the gluten-free spaghetti as the rest all were egg based. I queried this as I’d already been served penne in the MDR at dinner but my waitress persisted and so, the gluten-free option was what I was served. A tomato-based sauce was the only vegan sauce option and I opted for a whole lot of vegetables as no vegan soy mince is available. I knew I would be eating some pasta over the course of the cruise and had come prepared with my own vegan parmesan cheese to improve the ship’s offering. 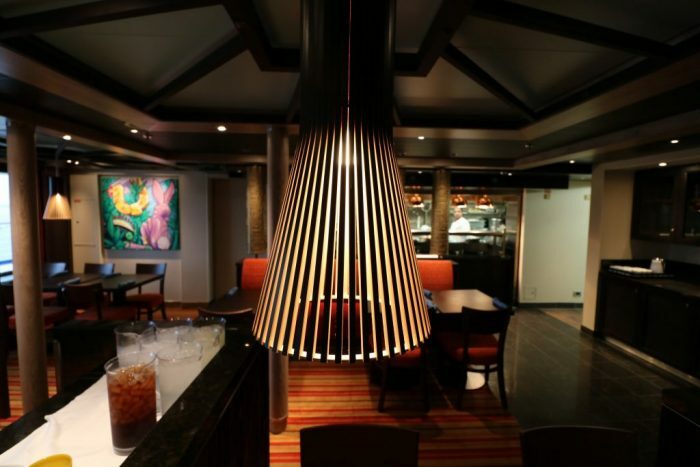 On the portside aft on deck 11, you will find the stunning (cute & quirky) lunchtime venue of Mongolian Wok, located in the JiJi Asian Kitchen. Although JiJi’s ala carte dining at dinner comes with a cover charge, lunchtime dishes are included in your cruise fare. The only noodles on the menu suitable for vegans here are the egg-free rice noodles. Unfortunately, none of the Chinese cooking sauces served at the Mongolian Wok are suitable for vegans. They all have oyster sauce on their base. The only vegan flavouring they can offer is plain soy sauce. So if you’re savvy and want to dine at Mongolian Wok, bring your own vegan cooking sauces with you. 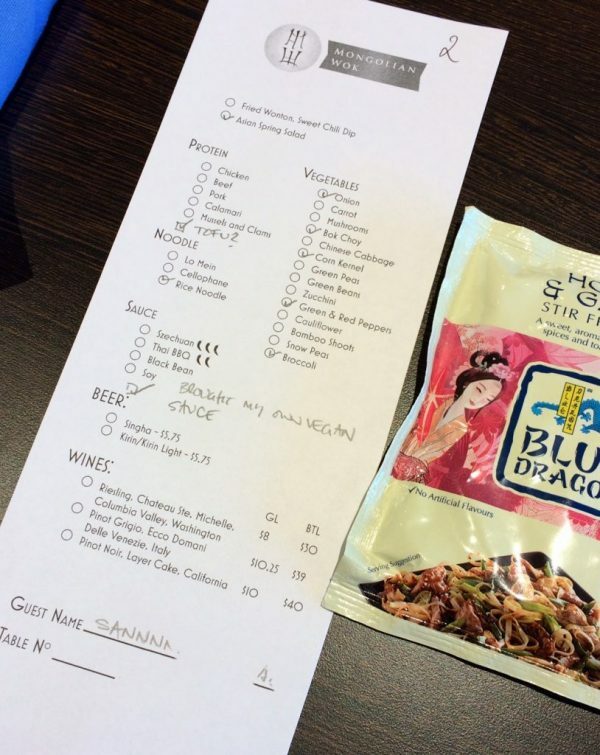 I packed two sachets of Blue Dragon cooking sauces with me and the chefs onboard were happy to use them. Again, no tofu here despite the MDR serving it at dinner. For vegan choice, pile on the vegetables. For starter dish at Mongolian Wok you have two options. First is a wonton crisp with sweet chilli dipping sauce, the second a simple but delicious Asian salad. 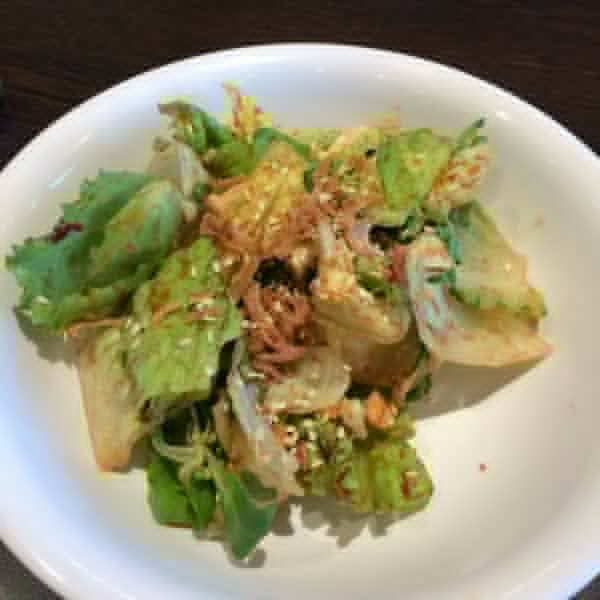 It comes with crispy fried onion and sesame oils and seeds. 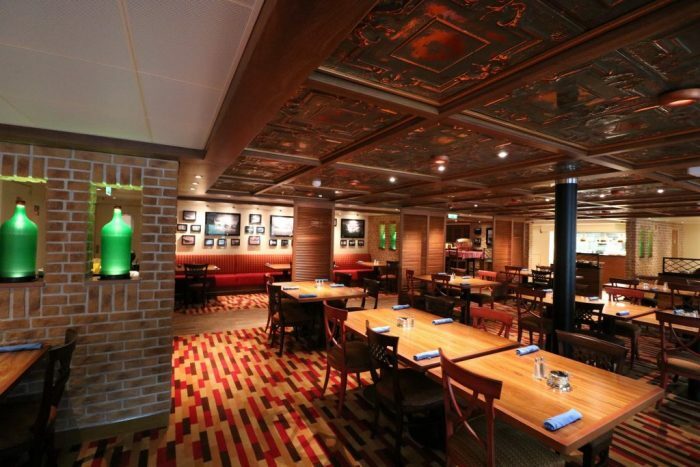 The aft of deck 10, walking from the Lido through the Marketplace buffet, you will reach a lovely aft bar & pool area. Very lovely piece of deck that never seemed too busy. Also allowed easy access to the adjoining Tides Bar and offered the best views of the wake. 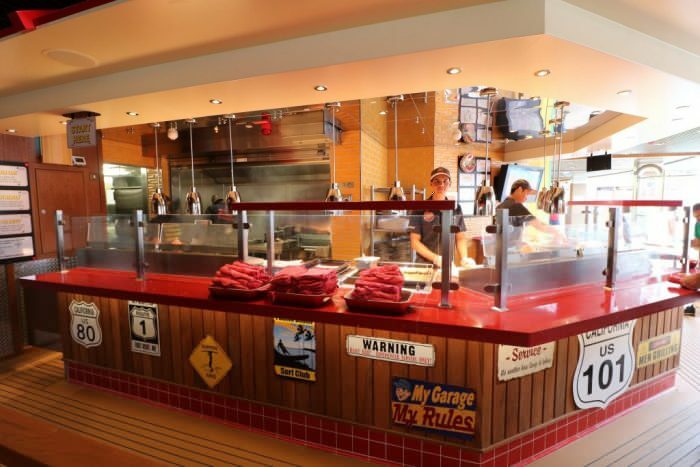 On the starboard side there is a paid-for seafood shack with some nautically themed seating. Not a lot to offer for us vegans so I tended to stay clear of that side. 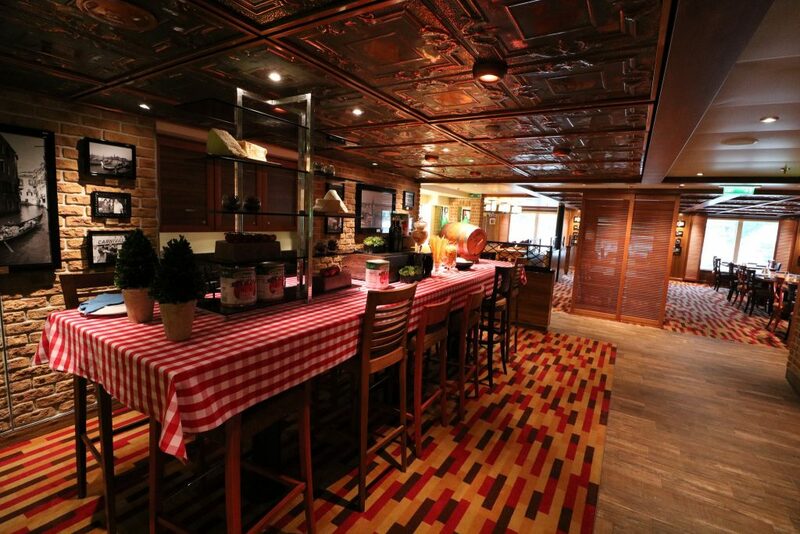 But on the portside of the aft deck there is a 24h pizza bar! 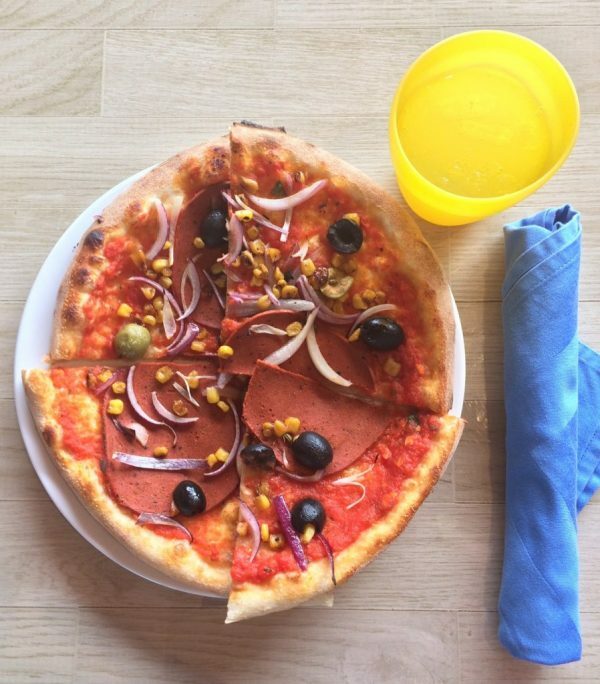 There are four pizzas on the menu and omnivores can have slices or a whole pizza. Us vegans, we can have our own pizza made just for us. It’s a necessity, really as the only veggie pizza on the menu has rocket (arugula), sauteed mushrooms and cheese. Frustratingly, when the toppings were queried with John Heald and Carnival head office, he responded on his FB page that the mushrooms are suitable for vegans. Yet, on Horizon, when I asked the lovely pizza chef, he told me the mushrooms were sauteed with butter. Perhaps practice varies, always check with your ship staff. 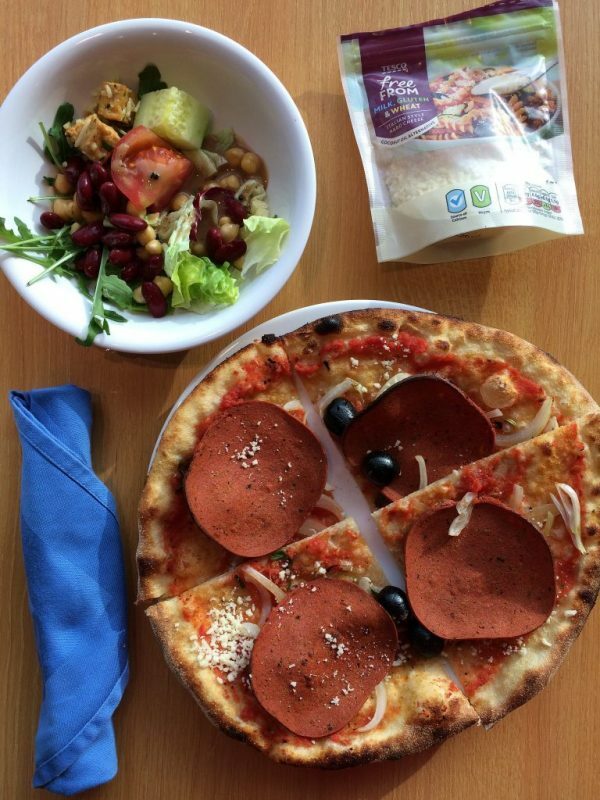 Thankfully the staff agreed that if it was quiet, they would make me a vegan pizza with my own toppings. I was able to have pizza with vegetables from the Marketplace salad bar. I also used my own vegan salami and cheese, which I brought with me and stored in the cabin minibar. Another big win for Carnival, having all the above choice for ‘free’ (included in the fare). I have been on ships where the option for lunch was the buffet only, or maybe the buffet with the main dining room (on a seaday). 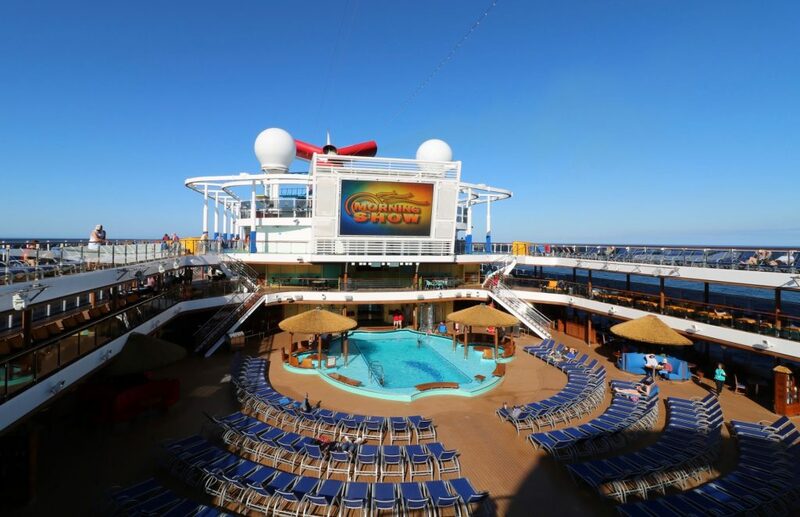 But Carnival Horizon offered excellent variety. 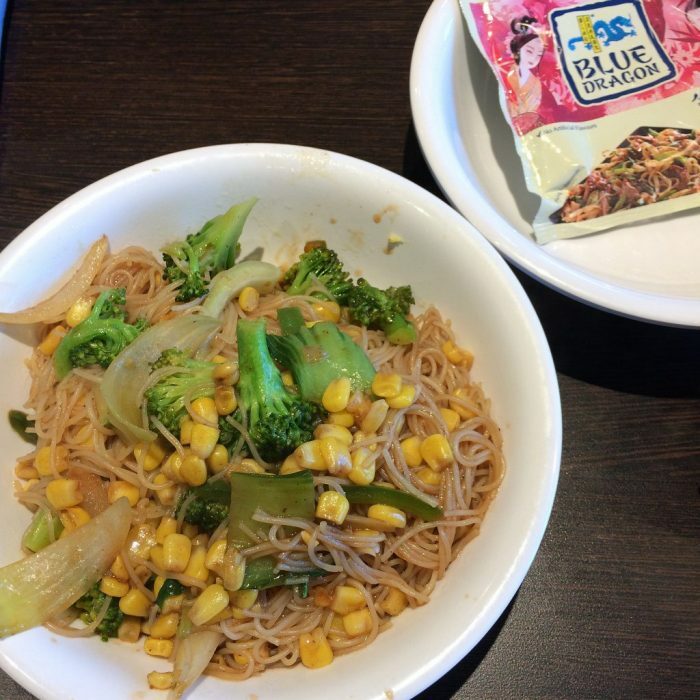 By mixing and matching, plus complementing your meal with home-brought extras (like the stir fry sauces) the range of vegan options onboard is rather phenomenal. Sure, there is room for improvement. Adding vegan mock meats, soy mince or even main galley tofu to the menus of Las Iguanas & Mongolian Wok would increase protein options for vegans. And making boiled rice just that – forgoing the butter. But at least it is possible to order plain rice, you just need to factor in a short delay. 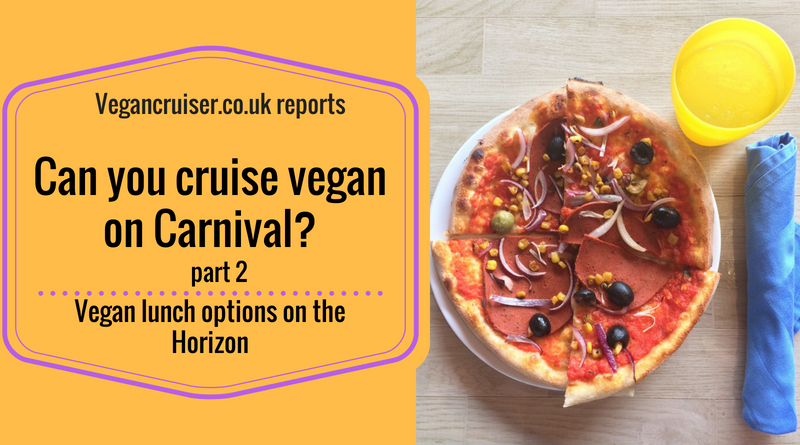 With a little bit of planning, you can definitely cruise vegan on Carnival! 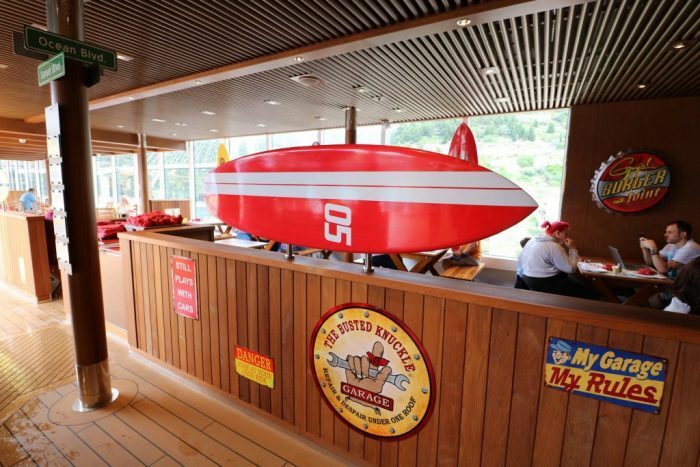 I really enjoyed my lunches onboard, what would you have? I would have it all, again, anytime! Had the best time onboard the Horizon – do check her out ASAP. 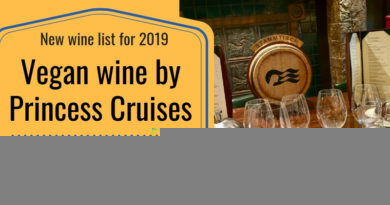 Princess Cruises gets more vegan friendly with a new wine list! 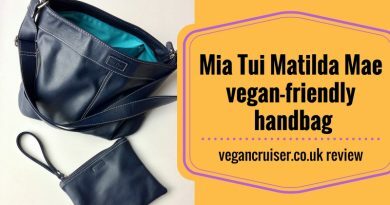 Mia Tui Matilda Mae handbag review – vegan and fabulous! Looks great. 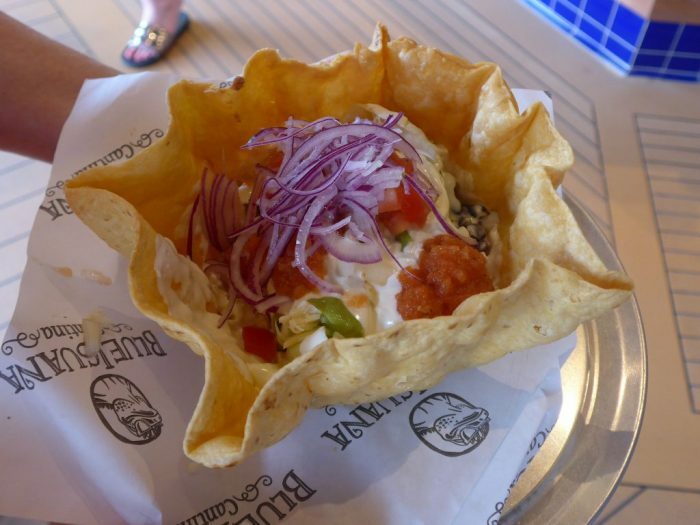 That burrito bowl is super cute and tasty I bet Great guide again for cruisers. Oh my gosh all that amazing food looks amazing! I need it all in my life! I can’t believe how far veganism has come! All this food looks looooovely, and I love the idea of bringing your own stuff to add to the meals. The company my parents go cruising with offer a fabulous vegetarian and vegan selection. They have even started vegan specific cruises. I’ve never been on a cruise yet but a 100% vegan one certainly makes it more appealing. Who is it your parents cruise with? 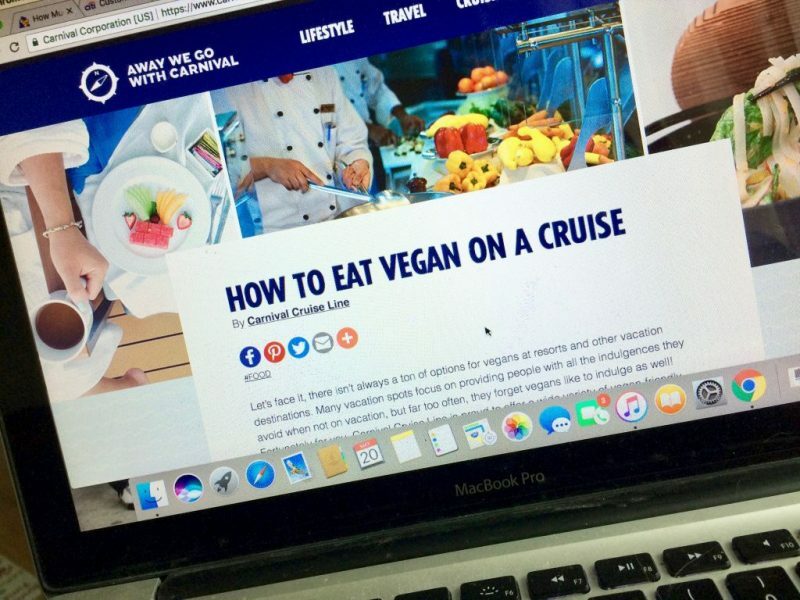 Vegan Cruiseplanners? How fab that dining was made so easy. 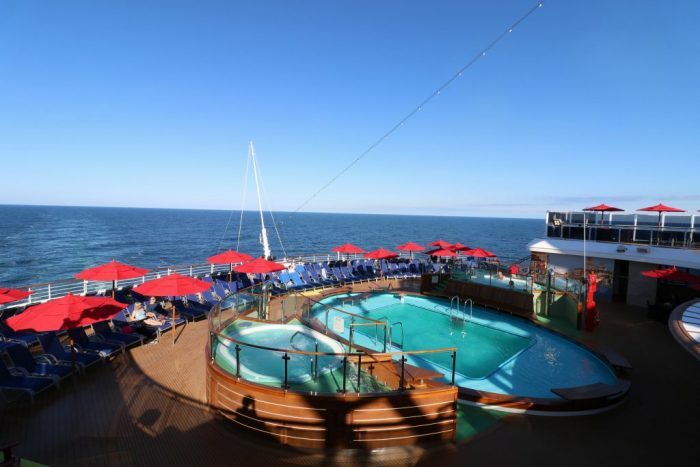 That’s what a good cruise should be all about – relaxing, no stress and plenty of delicious food options! 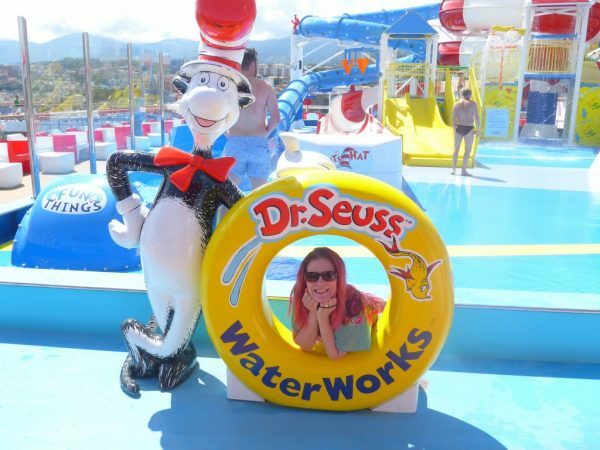 This is an interesting blog post Sanna, it’s great for any vegans worried about cruising with Carnival and you have proved that it’s possible to find vegan alternatives. The food looks pretty tasty too! I don’t think I’ve ever quite appreciated before how much effort you have to go to to ensure you are eating Gluten Free food. I can’t imagine having to take my own cooking sauces onboard to ensure a GF dish! Glad you found some great stress free, tasty options though too. Still room for improvement though isn’t there? Oh definitely. Only P&O are known to carry soya based ice cream (vanilla!) for dessert, and dairy free cheese and yoghurt at breakfast time. Such a simple little thing, and not just for vegans, yet… near impossible to get the basics. Princess, Carnival and Royal don’t even have dairy free spread.. as regular ‘Flora’ type vegetable spread usually has milk in it too. Until the ships learn to cater the way UK high street operators do, we need to carry on our extras. Gluten-free seems to be slightly better catered as it’s an actual allergy. CMPA is a real allergy to milk but somehow ships aren’t as aware.. and often they mistake it to be same as lactose intolerance which could be dangerous.